A learner-centered design begins with the question, “What must the learner be able to DO upon completion of the training, and what challenges will they face along the way?” Activities are then created that place the learner in realistic situations so that they can more easily relate to the content. Using a realistic context also helps with recall; studies have also shown that the more similar the practice environment is to the performance environment, the greater the learner’s ability to recall and apply knowledge. A learner centric design seeks to answer questions such as: Are the exercises effective at building relevant skills? Do learners find the exercises motivating? By contrast, a content-centric approach will focus on issues such as: Are all topics covered? Is the wording accurate? Are the colors correct? Then, develop an activity that helps the learners practice this skill in a realistic context. Elearning often uses extrinsic feedback such as “That’s correct!” or “No, the correct answer is …” Intrinsic feedback on the other hand mimics real-life, it shows learners how they are performing based on real-world measures such as sales won, or customer satisfaction. This increases motivation, and by encouraging students to learn from their mistakes, is more memorable than simply telling learners the correct answer. In this sample, learners must help a colleague quickly set up a laptop for a presentation. If learners make a mistake, they are not told explicitly that they are wrong. Instead, the wasted time is subtracted from the clock, the problem caused by the mistake is presented, and the colleague becomes visibly frustrated. Learners can try again, or go back and review the material. Good tutors will alter the timing of their feedback rather than provide immediate feedback for each response, encouraging learners to reflect on their choices. An effective tactic with delayed feedback is to pose a follow-up question asking learners to justify why they have chosen a previous response. According to elearning researcher Will Thalheimer, research suggests that, on average, delayed feedback is better than immediate feedback by about 10 to 25%. In this sample lesson, the learners’ task is to configure an enterprise software application. Before configuring the application, learners must be able to determine key performance measures that will be used as inputs for the application. When learners select a measure, they are not told immediately if it is correct or incorrect. Instead, they must justify why the measure was chosen. 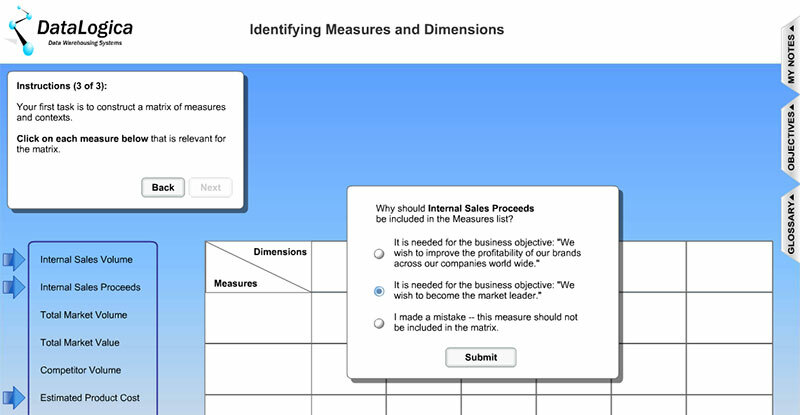 This helps the learners gain a deeper understanding of the relationship between performance measures and the end business goals. Case-based elearning challenges learners to gather information from various sources in order to make meaningful decisions. Information can be structured in any format such as text, graphics, hyperlinks, audio, or video. The case format encourages students to look at an issue from multiple perspectives and helps develop their decision making abilities. Branching scenarios can be included in the case, enabling learners to see the consequences of their decisions, making the experience more memorable and effective. 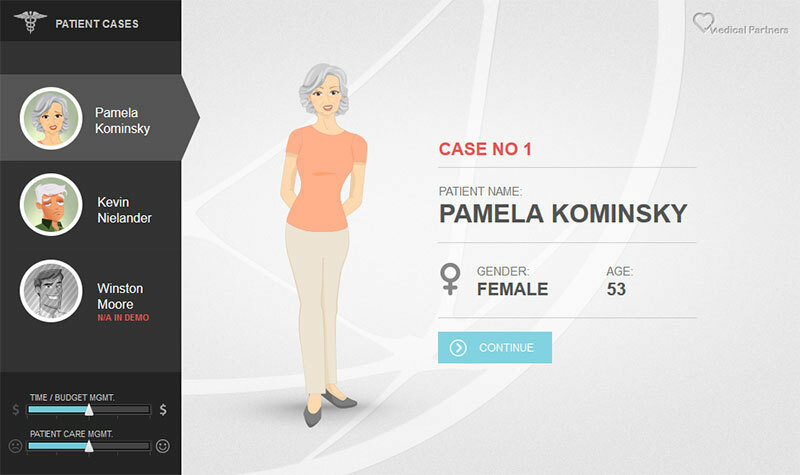 In this sample, learners play the role of a doctor. To make a correct diagnosis and recommend appropriate treatment, learners must collect relevant information about the patient’s history and current condition. Learners must also weigh budget and cost considerations when making decisions. The impact of these decisions is reflected in the status bars at the bottom of the page. The information resources are presented as simple text, but could easily be augmented to incorporate graphics, audio, video, or external resources, such as patient charts. 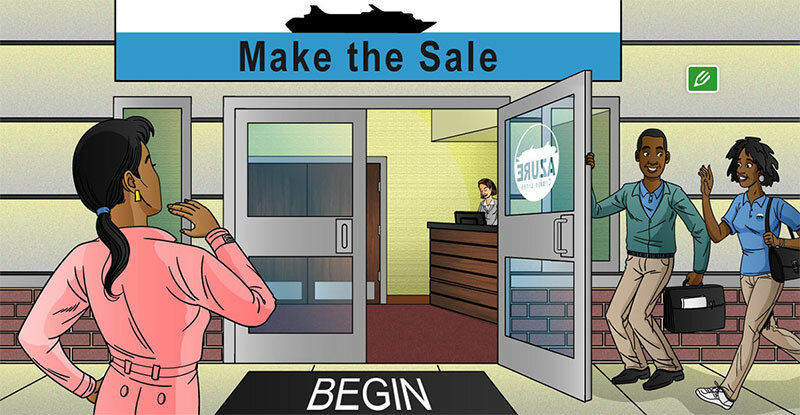 In this example, the learners must learn how to use a new application for supplying material to the army. To use the application more efficiently, they must learn the codes that are associated with the various transactions. This exercise helps learners remember the transaction codes and their categories. 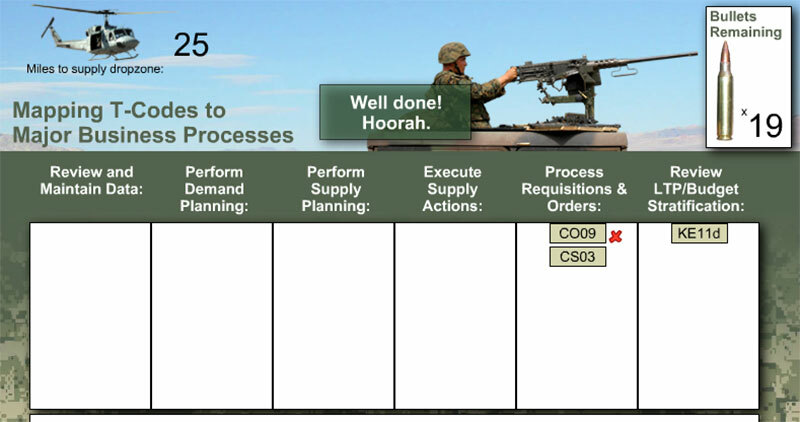 Here the elements “Bullets remaining” and “Miles to supply drop-zone” appeal to real-world motivational factors of the learner.